A note of caution: The reduced marker set (~30k) means that a lot of noise is added in the admixture estimates. In particular, many individuals are likely to get low-level admixture from population sources that can be attributed to noise. But, as we will see, the small marker set does not really affect either the power of the GALORE approach, or of ADMIXTURE to infer meaningful clusters. In addition to the various online sources of public data Dienekes got about a dozen South Asians. I was one of those South Asians, DOD075. In many ways I’m a rather standard issue South Asian, similar to Gujaratis, except that I have a substantial ‘East Asian’ component. More concretely, between 1/6 and 1/7 of my ancestry seems to be of eastern origin, far higher than the norm among South Asians. The rest of my ancestry was mostly South Asian specific, with a minor, but significant ‘West Asian’ component common across northern India. Rerunning with more data with different samples Dienekes came out with a different set of ancestral components. Of particular interest to me he broke down the East Asian between East Asian proper and Southeast Asian. Below are a selection of populations with ancestral components + me. I’ve also renamed a few components. North Kannadi = Dravidian and Irula = Indian tribal. Indian = Generic Indian. Looking at the Fst it seems that Indian endogamy and population bottlenecks has had an effect…look at the North Kannadi distance from everyone else. Remember that in the previous analysis I was very similar to a Gujarati, except with an East Asian element. My supposition that my ancestry has some connection to Burma seems to be supported by these results. Looking at my balanced ratio between East Asian and Southeast Asian, that is what one might expect from someone of a Burman ethnicity. I am not saying that I have recent Burman ancestry per se. Rather, Ahom, Mizo, Chakma, and a range of tribal populations from the liminal zone between South and Southeast Asia may suffice. The main other option is that I have a great deal of Munda ancestry. Not implausible in light of the likelihood that Munda brought rice agriculture to northeast South Asia, and pre-date Indo-Aryans, and possibly Dravidians, in Bengal. How would I distinguish these possibilities? I’ve ordered 23andMe kits for both my parents. The most likely candidate for recent Southeast Asian ancestry is my paternal grandfather. 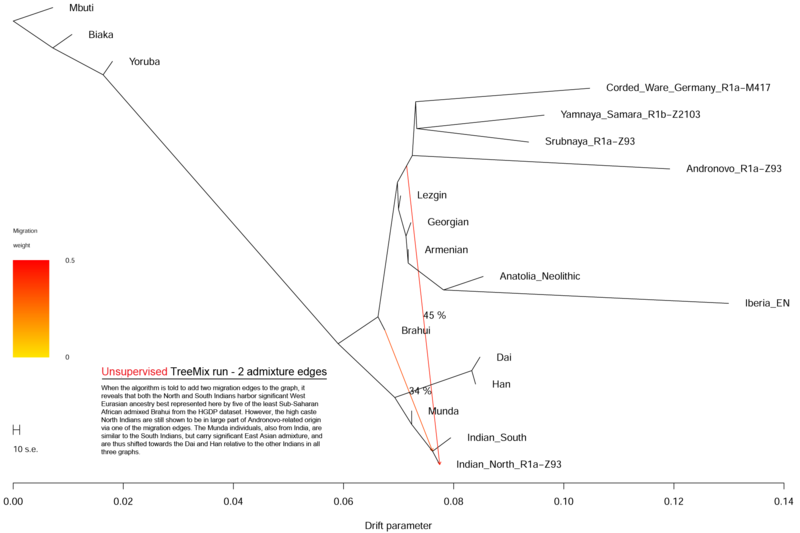 If the admixture event was recent, if I have a recent ancestor(s) of “hill tribe” origin, I would expect to see more linked regions of East/Southeast Asian origin than if the admixture was ancient (and so distributed more equitably across DNA strands due to recombination). The most exciting thing, however, is the fact that the origins of a part of the West Asian component of my previous analyses can be partially located: it is the purple component centered in Dagestan, i.e., among Northeast Caucasian speakers such as Lezgins, and the Dargins who inhabit Urkarah. Readers of this blog may remember the surprising appearance of this Lezgin-specific component in the Balkans (but not Greeks) a few weeks ago. Now it has turned up as a substantial component in India as well. Back then, I speculated that this component may derive from a prehistoric population that was spread in (but not limited to) the northern arc of the Black Sea from the Balkans to the Caucasus. Even in this analysis, you can see that both Romanians and Hungarians have some of it, and so do Lithuanians and Belorussians, while Tuscans (like the Greeks of my previous experiment) do not. Hence, this component stretches from at least the Baltic to India, but is largely absent in southern Europe. I will go out on a limb and propose that this component is representative of a non-Indo-European component in the ancestors of the Indo-Iranians. 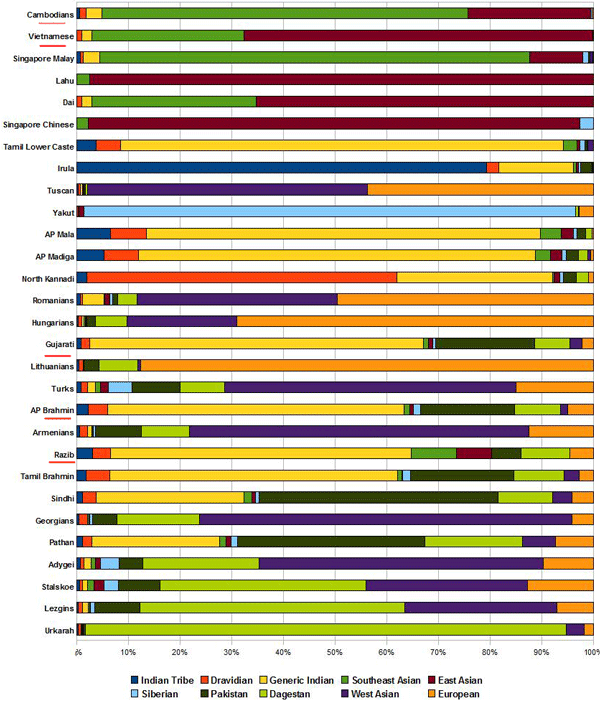 Paul Conroy observes that on this finer-grained analysis I don’t have any “West Asian” at all. What had previously been West Asian terms out to have been, in my case, a compound of Dagestani + European. I can’t say that I’m that surprised by this. Years ago I noticed that HGDP STRUCTURE analyses were always giving suggestive signs of a connection between West-Central Eurasia and South Asia. Who were the Indo-Iranians? I lean toward the proposition that they do derive from the Andronovo culture of the Eurasian steppe. This would date the entrance and expansion of Indo-Aryans in northern India 3-4,000 years ago. I also contend that the dominant element of ancestry among modern South Asians is not Indo-Aryan. Rather, it is an ancient stabilized hybrid of pre-agricultural societies in the Indus valley and Neolithic farmers who originated from what is today western Iran and eastern Anatolia. Therefore, I posit that the “Aryanization” of the Indian subcontinent is properly modeled as the same processes which led to the emergence of an Anatolian and Rumelian Turkish identity; a small elite population which forces a identity shift among the majority. As I’ve remarked in the past, Eurasia can be broadly seen as the playground of three major groups of people: the Caucasoids of the West, the Mongoloids of the East, and a southern group of people which is most strongly represented in South Asia, but whose presence can be detected in Southeast Asia as well, although in the latter case it has been marginalized and/or absorbed by the arrival of Mongoloids. This southern group of people has sometimes been called “Australoid” because of its perceived resemblance to Australo-Melanesians. Indeed, in my K=5 mega-analysis an affinity between Papuans/Melanesians and people of South and Southeast Asia is apparent. These “Australoids” are very old populations, probably stemming from the early Out-of-Africa coastal dispersal route, and we shouldn’t be tricked by their phenotypic similarity into thinking that different groups of them are particularly close genetically. Just as “black Africans” are not the same, neither are the “Australoids” and mixed-“Australoids” at the shores of the Indian Ocean. It is probably the invention of agriculture that is responsible for their marginalization. In Africa, the Pygmies and Bushmen have been absorbed or pushed aside by the demographic Bantu juggernaut, with a few other language groups also hitching a ride on the agriculture/pastoralism economy. In West Eurasia, where agriculture was invented earliest, pre-agricultural populations left no traces. In East Eurasia, the agriculturalists could not expand to the far north where many relic populations exist, but they could (and did) move to the south where they assimilated or drove away pre-existing populations, leaving a few of thems, like the Taiwanese Atayal as partial remnants of the older population stratum. The Irula are South Indian tribals, so they are the the closest one can get to South Asian autochthons, and yet even they presumably have a large minor component of “Ancestral North Indian.” The tribal groups in Reconstructing Indian Population History all exhibited proportions on the order of ~40% ANI. It seems that agriculture “stalled” in the Indus valley and the highlands to the west for thousands of years in South Asia. During this period of stalling I believe that the farmers absorbed a great deal of genetic material from the indigenous hunter-gatherers, and so produced a “distinctive” Indian genetic profile. More West Eurasian than not, but with a very large dollop of the ancient substrate of southern Eurasia which had a distant, but closer, affinity with that of East Asia. Once social and cultural forces allowed for the rapid expansion of farmers there was a wave of advance from the Indus valley east and south. In the east the proto-Indians would have encountered Mundari speaking groups drifting who practiced rice agriculture, which they also adopted. In the south the proto-Indians would have encountered more hunter-gatherers. Many of the tribal people in India are today facultative hunter-gatherers, herders, and extensive farmers. I believe that these marginal proto-Indian groups assimilated hunter-gatherers more easily than would have otherwise been the case because some of the proto-Indians reverted to a hunter-gatherer lifestyle in the agriculturally unsuitable highlands of the Deccan and Chota Nagpur. The social boundaries in the uplands of South India were such that the line between hunter-gatherer and farmer was more fluid than elsewhere, explaining the former’s greater genetic impact through intermarriage and assimilation. This sort of general dynamic probably applies to Indo-Europeans. There is no reason why the original Indo-European tribes could not have been compounds who picked up different ancestral components in their peregrinations. Compare the various Turkic people, Anatolian Turks, Chuvash, and Yakut. All of them have affinities with nearby peoples, despite having a common Turkic culture and genetic component. One notable trend in Europe is that while the French have a minor, but significant West Asian component, the Basque have none of it. Dienekes’ sample is small, but it looks as if Scandinavians have more of this than the Finns. This West Asian component may not have been the dominant one among the Indo-Europeans, but I suspect it was a significant one. If the original speakers of proto-Indo-European did not have it, they likely absorbed early on, just as the West Asians absorbed a native South Asian element in the Indus valley. Finally, as a general rule of thumb, I would now suggest that the primary way in which hunter-gatherer genes can persist is through an ecological stall on the part of farmers. During the stall gene flow naturally occurs, probably through exchange of females (coercive or not), or the integration of hunter-gatherer males into war-bands or as slaves. Over time the farmers on the frontier have changed genetically, so that when they start expanding rapidly due to a technological or cultural innovation, they share more with the hunter-gatherers whom they supersede than they otherwise would have. 10 Comments to "South Asians Too Are Sons of the Farmers?" There are several plausible sources for the West Eurasian component collectively identified as Ancesteral North Indian: (1) the original Out of Africa population of the area, (2) Harappan (aka Indus Rivery Valley) colonization from Mesopotamia or Iran (probably in a single rather cohesive wave), (3) Indo-Aryan influence, and (4) subsequent Western invaders e.g. Greek and Muslim and English. The last possible source, while plausible, seems unlikely in light of the evidence, to have had much of a population genetic impact. 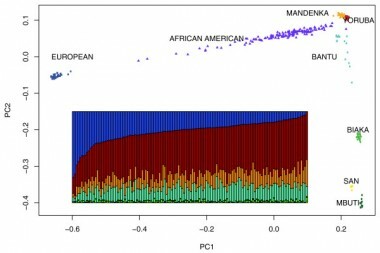 An ability to genetically parse Out of Africa v. Harappan v. Indo-European contributions to ANI would be desirable, if it could be achieved, because it would tell us more about who each of these ancient populations really were, and also because it would help resolve our understanding of the process by which Eurasians became genetically distinct from Africans. Sometime between the formation of an Out of Africa founder population (somewhere) and the arrival of people in Australia ca. 50,000 years ago, a whole lot of mutations across the genome appear that have very wide geographic dispersal even for genetric patterns many mutations removed from Africa. Pylogenetically, we can determine which versions are more ancient and which are more recent. But, if for example, a particular pattern of genes is common in Northern Pakistan, the multiple layers that we know exist in the population make it hard in isolation to determine when and from where that group of genes entered the mix. #1 is not plausible. ANI is not that far from west asian and europeans Fst wise. ASI is. keeping ANI and ASI so distinctive but geographically close is totally implausible. the only way this could work is if ANI is ancestral to west asian and european groups, which is implausible for other reasons. #2 is not as implausible, but it is unlikely to be the whole story because tribal dravidians in south india have a substantial fraction of ANI. it was always a problem also that r1a1a was at non-trivial frequencies among these same groups too. the indo-aryans may have had a non-trivial impact, but i don’t think they can explain the preponderance of ANI. minor note: just realized that my ratio of east asian:southeast asian is probably too balanced to be purely munda. The driving force behind this hapmap research is the race-based medicine industry. I’m surprised how much generic indian and how little dravidian that tamil lower castes have. I’d expect them to be more like kannada. Likewise for the madiga. Any ideas on why this is? my labels are probably misleading. see dieneke’s original post. The labels seem to be ok. Based on purely geographical grounds, I would have expected the amount of North Kannadiga component to be similar to that in AP or Tamil lower caste or to that in AP or Tamil Bramhins. Does this indicate that this is a component which brings about a finer distinction between Kannadiga populations on the one hand and Tamil and Telugu populations on the other? Dravidian Dalits (Mala, Madiga, Pallar etc…) have reasonably high percentage of R1a1 (>20%). However, Dravidian middle castes (Kamma, Velama, Okkaliga, Goundar, Vellala, Reddy) exhibit relatively low levels of R1a1. And in between, middle and lower, artisans (weavers) and herders may also exhibit high levels of R1a1. Based on the caste names and cultural motifs, artisans and herders definitely have north (or east India … UP + Bihar .. Magadha region) Indian admixture. I assume that would be the case with Dalits too. The name Mala, Mallar (Pallar) does have resonance in North India. Madigas are traditional shoemakers. And shoemakers make up the bulk of North Indian Dalits. 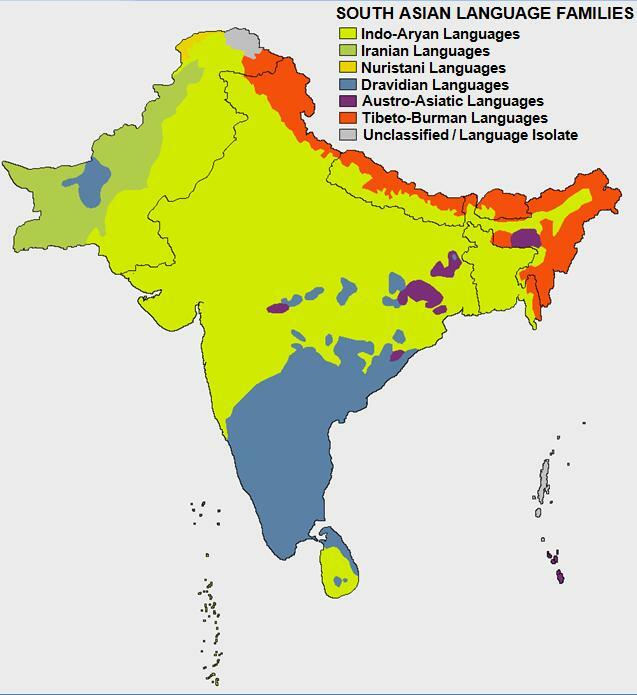 Interesting would be Dravidian middle castes across South India and Dravidian tribal (with lower R1a1) comparison. Some caution has to be taken for Nayars of Kerala and Bunts of coastal Karnataka. I’m with ss. The north kannada component is still mysterious. Any speculation?